In preparation for the Super Bowl next Sunday, I’m running a three-day Taco series. They’re easy, they’re delicious, they’re customizable, they’re crowd-pleasing. In short, they’re the perfect game food. Tomorrow, I’ll be serving up a vegetarian taco and Wednesday will be the taco no one saw coming. Mwahahahaha! I’ve been on a taco kick lately. Okay, truthfully? I’ve been on a taco kick my entire life. I guess it’s just been more pronounced lately. But honest-to-goodness people, what isn’t to love about tacos? It’s good stuff wrapped in good stuff topped with good stuff then eaten with your hands. Win, win, win, WIN! Tacos aren’t ALL I’ve been obsessed with lately; I just can’t get enough lamb. Mmmmm… tender, succulent, meaty lamb. It’s hard to go wrong there, too. 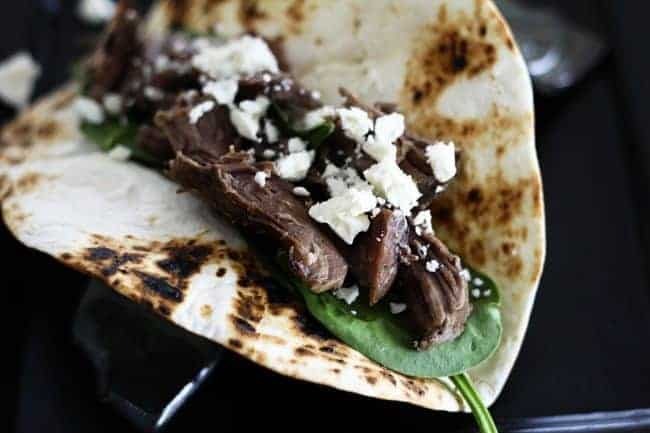 It really was just a matter of time before I made a Greek taco, and it all started with a gorgeous leg of lamb that I dropped into my slow-cooker with garlic, lemon and oregano and braised ’til it fell apart. Next up was a cucumber dill yogurt sauce, diced bell peppers, garlic stuffed kalamata olives and a healthy dose of my drool. I’m sorry. That kind of ruined it, didn’t it? If you haven’t had lamb before, this is a great recipe to try. It is garlicky, lemony and herbed to a high state of fabulousness. There’s no tricky preparation, no worry about hitting the perfect temperature and no carving. Since the recipe makes a large amount, it is also a great candidate for Make Ahead Monday. Freeze any leftover lamb with the reduced pan juices in meal-sized portions in freezer bags or freezer safe containers. Then, whenever you need a stiff dose of Greek food, you’re only a defrost away from today’s Greek tacos or braised lamb on polenta or braised lamb on lemon dill rice… You get the picture. It’s good stuff to have on hand! Speaking of getting the picture… Take a closer look at my taco holder. 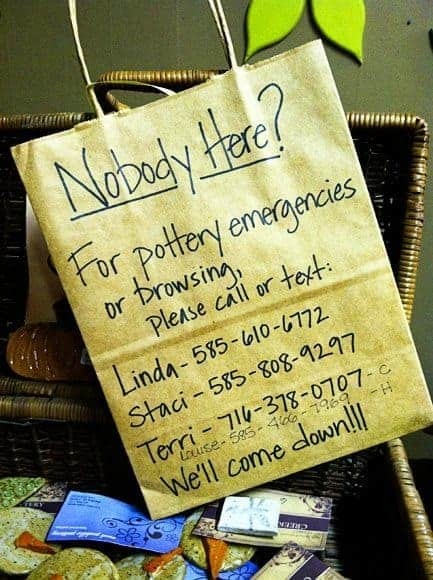 All their pottery is dishwasher, oven, and microwave safe. If that doesn’t make it the perfect taco-ware, I just don’t know what does. Staci is the taco/business card holder maker (and maker of this cake plate), for the record. And also for the record? This is NOT a sponsored post, I just think the whole word needs to know about this place. Now. Onto that lamb and those tacos and some drooling. Really, I am sorry. I should stop. Don't be intimidated by lamb. This simple, garlicky, lemony, herbed, succulent lamb braises up beautifully in the slow-cooker. 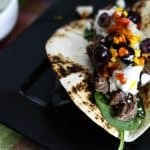 Served over polenta, lemon rice or on these fast, fresh, delicious Greek Tacos, you'll be so glad you made enough for more than one meal!Freezer Friendly for Make Ahead Monday. 1 boneless leg of lamb 4-6 pound, *See Notes regarding using bone-in lamb roasts. Place the lamb roast in a slow-cooker and rub it with the black pepper and salt. Add the extra virgin olive oil, on top of the roast and use your hands to rub it around to evenly distribute the oregano and oil. Add the zest and juice of the lemon and scatter the garlic cloves over and around the lamb roast. Cover and cook on high for 4-5 hours, or until it falls apart easily when two forks are inserted into the center of the roast and pulled in opposite directions. Carefully transfer the roast to a cutting board, pour the pan juices through a strainer over a saucepan, and press the contents of the pan to get as much juice (and roasted garlic) into the saucepan as possible. Over a medium high flame, reduce the pan juices by half. While those reduce, use your hands or two forks to pull the lamb into bite-sized pieces. Pile the lamb into a serving bowl and pour the reduced pan juices over before serving. 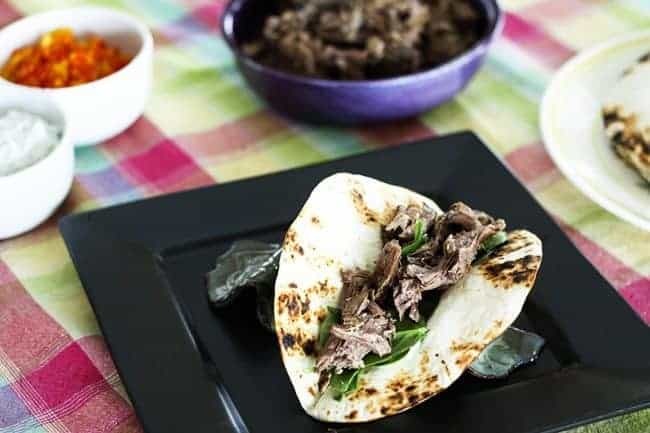 Portion leftover lamb into meal-sized servings (along with pan juices) and freeze in freezer bags or freezer safe containers for up to 6 months. Stir together the Greek yogurt, cucumber, zest and juice of the lemon, diced onion, minced fresh dill weed, and minced garlic. Refrigerate until ready to serve. 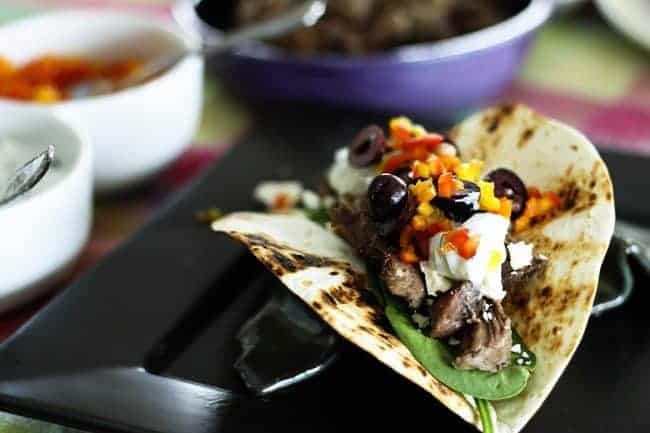 Pile each tortilla with about 5 or 6 baby spinach leaves, a layer of lamb, feta cheese, yogurt sauce, olives and diced peppers. Serve immediately! You can definitely make this with bone-in lamb roasts. It will probably take a bit longer (by an hour or two or even more! ), but will be even more flavourful. Use whichever you can find most easily and whichever fits your budget best. I’ve been craving tacos lately like you wouldn’t BELIEVE — and these have definitely topped the list! So much yum! These look fantastic…anything with feta on it is good with me. Saving to Ziplist, making this weekend. Thanks! I am a taco freak. LOVING the greek touch to these!!! Yum! I think gyros, which is a great thing! Now I’m drooling! And the sauce with pita/taco chips—-great dip for game day! LOVE lamb! Thanks for sharing this recipe. 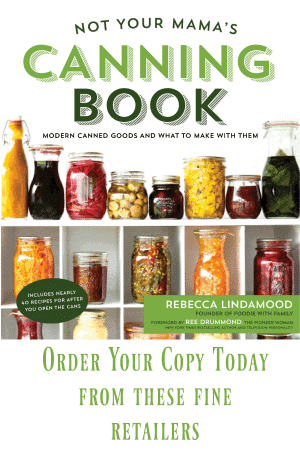 With a freezer full of it, I am always looking for new and great ways to cook it. This sounds SO good and it will definitely be on the food roster for this weekend! 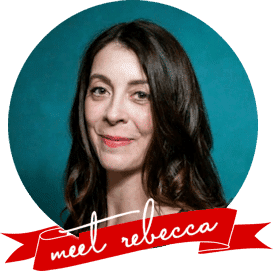 Rebecca, this recipe is amazing! I made these last night and they were soooo good! This will definitely become a repeated favorite recipe. I have been thinking about this recipe since I first saw it, and made it last night. It was everything I dreamed it would be – soooooooo good. Equally delicious today. I don’t know if any of it will make it into the freezer. This one is a keeper for sure. The only “meat meat” we eat is lamb. We live in a small multi ethnic community with established Halal butchers, so getting lamb: FRESHLY butchered lamb the way we want (chops, legs, stew meat, ground) is fairly easy, and one small lamb lasts about two months. Having trouble finding “exotic” meat ? ( and some think lamb is just that) Find an established greek, kosher or halal butcher. Use the local Yelp or Chamber of Commerce. Love your recipes & inspiration! Just notice the ‘make-ahead Mondays’ tag-line & catchy as it is, let’s keep Mondays meat-free! It’s the best way I’ve found to give my budget a real boost. How about ‘Freezer Fridays’ instead? That way we can boost our budgets and relax into the weekends with a time-saver meal like this one. Thanks again for your inspiring ideas! Thanks for the idea, Dylan, but my household doesn’t participate in Meat-free Mondays, in general. Believe it or not, we tend to do meat free Fridays quite often when we do meat-free. It’s a hold over from the Lenten season. And not all of my make-ahead dishes are freezer friendly, so I’ll probably keep on keepin’ on with my Make-Ahead Mondays. I just found this via Kayln’s Kitchen and I am drooling, too!! I must rush out right now, buy a leg of lamb and fire up the crock-pot. Because you’re tossing it with pan juices after it braises, you should be fine! Yo this is straight up bomb.com so good set on low and let cook over night and all morning until noon. so good. smell fills up whole house. That is my kind of feedback, Leif. I’m so glad you liked it. You had me at “fally-aparty”. Sign me up!